This post on feeding your herb gardens for less contains affiliate links. Once you get your herb garden up and running, how do you make sure it stays vibrant and flourishing for you? You will want to be sure your herbs perform at their best and look their best. 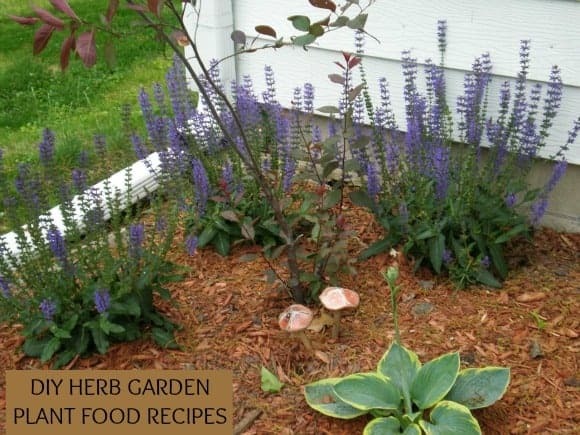 Feed your herb garden and help it grow beautifully! Luckily, you don’t need to invest in any pricey plant foods, nor do you need to try any dangerous chemicals to get your herb garden in great shape. Below, you will find some simple home remedies for your herbal plants that will keep them looking their best and producing plenty of fresh herbs for you to enjoy in your kitchen! If you ever thought that store bought plant foods and dangerous chemicals are the only way to keep your herb plants healthy and disease free, think again! For just pennies you can mix up your own safe concoctions that your herb plants will love you for. Take a look at how easy it is to be your own at home botanist! Feed and protect your plants for less with these easy to follow tips and recipes. You will never go back to dangerous store bought products again. First, let’s take a look at what supplies you will need for these various recipes. They are all common household items and ingredients that you probably already have on hand. If not, you won’t need to go further than your local dollar store or grocery store. These ingredients are all safe, inexpensive, easy to find, and easy to use. Now let’s get started! You will want to gather some mixing bowls to mix all of these recipes up as well as labeled spray bottles to store them in if you are not using them right away. Keeping bottles labeled is important so other household members know what they are. Did you know that the common household item Epsom salt is made up of magnesium and sulfate? Plants adore these nutrients. Use the mixture to water your plants at their base. You can then re-feed once a month. Don’t toss those used coffee grounds. They are packed with plant feeding nutrients! Coffee grounds are rich in nitrogen, magnesium, and potassium! Take your newspaper and lay it over your cookie sheet. Spread your used coffee grounds on the sheet, and allow to dry. Sprinkle the grounds around the base of your plants. Egg shells are packed with calcium carbonate which soil loves. Just save your breakfast shells and allow them to work their magic. Rinse your used egg shells and then allow them to air dry. Then, place the dried shells in the blender. Sprinkle into your soil and cover well. This is one of the easiest DIY plant foods you can try. All it takes is two ingredients you can find in any kitchen. It costs just pennies and the soil will just devour it, creating a healthy base for your plants. Simply combine the white vinegar and water in a dish. Mix well. Add to a spray bottle or watering can. Use the solution to water your plants and repeat every three months. This plant food is a favorite because it lets you reuse something that would otherwise be getting poured down the drain. Fish water is full of nitrogen and is perfect to feed your plants. Used fish tank water…that is easy, huh? All you need to do is retain the water when you clean your fish tank. Pour it into the base of your plants, directly into the soil. If you don’t have a fish, you can always ask a friend or family member who does to retain theirs for you in a gallon jug. Making your own plant food for your herb garden has never been easier or cost less. You will wonder why people pay big bucks for it at the store when natural and inexpensive options such as these are right under their noses. Well now you know better, and can start saving money and trips to the store when it comes to feeding your herb garden! Looking for more great herb garden articles? Check out 7 Simple and Surprising Uses for Herbs, The Frugal Herb Garden Series: 7 Clever Ways to Save Those Herbs for Later and Ways to Get Kids Active In Herb Gardening! This is great – for some reason I never have any success with herbs! The vegetables and fruit always do well, but the herbs die a miserable death! These are great tips, thanks so much! I just moved into a house with some raised garden beds and we are excited to grow our own veggies this year. We love using coffee grounds in the garden but I never thought to add the fish water! Such a great idea. Great tips! I hope to start my own little garden whenever we purchase our own home. I’ll have to pin this for future reference! Thanks so much for sharing this! I am always looking for inexpensive ways to improve my gardening! Thanks so much for linking your post to the garden linky this week! What great tips! We tried a little herb garden a couple of years ago and it actually did well (to our surprise :-)), but then life got busy and we didn’t keep it going. But your instructions seem so easy, it’s making me want to try again. It’s so nice to walk into the backyard and see the fruits of your labor blossoming! This is awesome! I’ve been dying to plant a garden, but the Arizona soil in my backyard just won’t take it. One day! Bookmarking this post for later!